This story has been updated. Click here for the latest version. The original story, published Wednesday evening, is below. WASHINGTON — President Donald Trump isn't going to just let go of Sen. Lisa Murkowski's no vote Tuesday against debating Obamacare repeal. Early Wednesday, Trump took to Twitter to express displeasure with Murkowski's vote. By that afternoon, each of Alaska's two Republican senators had received a phone call from Interior Secretary Ryan Zinke letting them know the vote had put Alaska's future with the administration in jeopardy. The response follows Trump's no-holds-barred style of governing, even when it comes to his own party. It is his first strike of retaliation against Murkowski, however, despite her tendency to stray from the party line and the president's priorities. Alaska Sen. Dan Sullivan said the call from Zinke heralded a "troubling message." Murkowski was not available for comment. Spokespeople from the White House and the Interior Department did not respond to inquiries. Sullivan said he had discussed the calls with Murkowski, and his concerns remain. Murkowski and Maine Republican Sen. Susan Collins voted at odds with their fellow Republicans on Tuesday to begin floor debate on legislation to repeal and replace the Affordable Care Act. The vote was on the House-passed health care bill, rather than the Senate legislation that has faltered in fits and starts in recent weeks. Much remains unknown — how far the White House will go to punish or pressure Murkowski, what exactly the impact will be for Alaska, and just how it will play out. 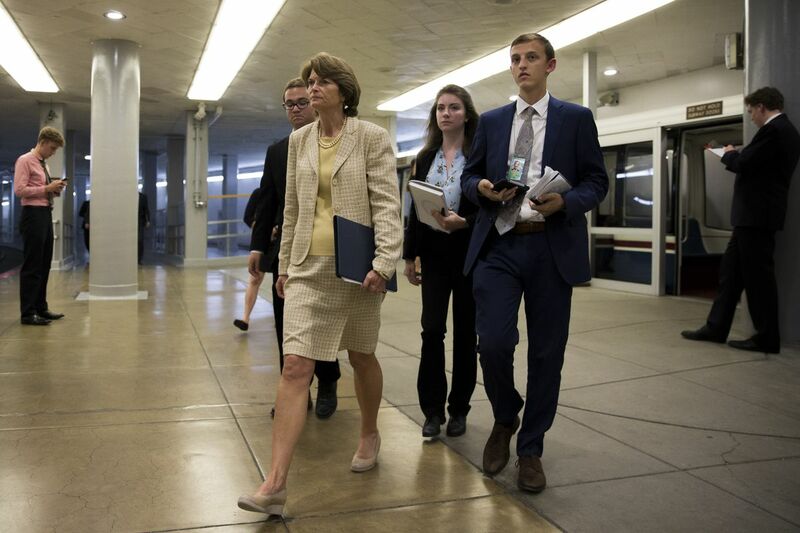 Murkowski chairs the Senate Energy and Natural Resources Committee and has used the position to drive home Alaska priorities, particularly with Interior nominees. She oversees the confirmation process for the Interior Department. On Wednesday, a committee hearing on nominations to the Interior and Energy departments was postponed indefinitely. A reason was not posted. For her part, Murkowski said Tuesday that she was not deeply concerned about pushback from Alaska Republicans about her vote. Trump has shown a willingness to go after members of his own party when they go against his preferred agenda — an unusual presidential tactic. Last month, Nevada Republican Sen. Dean Heller faced an advertising campaign over his opposition to the health care bill, run by America First Policies, a nonprofit group that backs Trump's agenda. Trump ultimately suspended the advertising campaign after complaints from Republican senators, but kept up pressure on Heller, even saying at a White House meeting with Republicans, "Look, he wants to remain a senator, doesn't he?" Heller is facing a tough race in 2018; Nevada is a swing state. Murkowski, on the other hand, is not. She won her re-election handily in 2016, and does not face re-election until 2022. So a threat to "primary" her over the vote means little at this moment. But Trump made it clear he was unhappy with Murkowski's vote Wednesday morning, taking to Twitter to air his unhappiness. When asked about the tweet in a hallway interview Wednesday morning, Murkowski told an MSNBC reporter that future elections did not weigh into her decision on health care. "We're here to govern. We're here to legislate. We're here to represent the people who sent us here. And so every day shouldn't be about campaigning. Every day shouldn't be about winning elections. How about just doing a little bit of governing around here? That's what I'm here for," she said. Murkowski has been at odds with Trump at times — occasionally refuting his more controversial statements. She took a stronger approach toward the end of the presidential campaign, saying she could not support his candidacy and would write in a vote for someone else. But Trump hasn't struck back at Murkowski in the past. She has been invited to the White House numerous times, and as a potential "swing vote" has repeatedly been seated next to or near the president during negotiations and meetings. It is not clear whether the president offered Murkowski any deal on health care — or any threats prior to her vote. Trump has not tweeted about Murkowski in the past, and rarely about Alaska. He retweeted a "Fox & Friends" story earlier this month about a missile defense test off the coast of Alaska. And in 2014, he tweeted about Russian President Vladimir Putin seizing Alaska, and a follow-up saying Putin wouldn't want the state, because the Environmental Protection Agency would make it impossible for him to drill for oil.